Over the years, approaches to obesity prevention and treatment have gone from focusing on genetic and other biological factors to exploring a diversity of diets and individual behavior modification interventions anchored primarily in the power of the mind, to the recent shift focusing on societal interventions to design "temptation-proof" physical, social, and economic environments. In spite of repeated calls to action, including those of the World Health Organization (WHO), the pandemic continues to progress. WHO recently projected that if the current lifestyle trend in young and adult populations around the world persist, by 2012 in countries like the USA, health care costs may amount to as much as 17.7% of the GDP. Most importantly, in large part due to the problems of obesity, those children may be the first generation ever to have a shorter life expectancy than that of their parents. 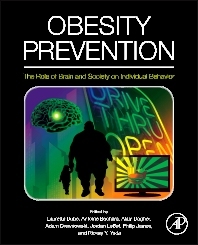 Obesity Prevention presents the most current research and proposals for addressing the pandemic. Past studies have focused primarly on either genetic or behavioral causes for obesity, however today's research indicates that a strongly integrated program is the best prospect for success in overcoming obesity. Furthermore, focus on the role of society in establishing an affordable, accessible and sustainable program for implementing these lifestyle changes is vital, particularly for those in economically challenged situations, who are ultimately at the highest risk for obesity. Using studies from both neuroscience and behavioral science to present a comprehensive overview of the challenges and possible solutions, The brain-to-society approach to obesity prevention focuses on what is needed in order to sustain a healthy, pleasurable and affordable lifestyle. Researchers and practitioners in industry and academia who seek to understand and address the underlying causes of obesity and to develop preventative behaviors and environments. Those studying obesity prevention approach it with a variety of background experience including those in: Nutrition, Dietetics, Epidemiology Neuroscience. Behavioral scientists and sociologists seeking to establish new behavioral patterns for both individuals and societal communities.